Guyasutha, or Kiashuta as the name is more frequently spelled in the old Records, and which spelling probably corresponds more nearly with the true pronunciation--was the leading spirit of the Senecas in this part of the country, and was one of the most powerful chiefs of his time. The accepted spelling is Kiasutha, which signifies "it sets up a cross." Although he is always mentioned as belonging to the Seneca he probably belonged to the mixed band of Iroquois along the Allegheny and Ohio who were called Mingo. While the Iroquois as a confederation remained neutral, these Mingo were openly hostile to the English. They were of mixed blood rather than belonging to any one tribe. The following extracts come from a sketch of Guyasuta by Neville B. Craig, Esq. "That ubiquitous character (whose name is so variously spelt Guyasoota, Keyasutha, Guyasotha, Kiashuta, and various other names), who long acted a conspicuous part near the Ohio, was at the treaty with Bradstreet, and afterwards was a leading actor in the conference with Bouquet. He was certainly a very active leader among the warriors of the Six Nations. The first notice we have of him is in Washington's journal of his visit to Le Boeuf, in 1753. The name does not appear in that journal, but Washington mentions in the diary of his visit to the Kenawha in 1770 that Kishuta called to see him while he was descending the Ohio, and then states that he was one of the three Indians who accompanied him to Le Boeuf. He was afterwards, as we have before stated, one of the deputies at the treaties with Bradstreet and Bouquet. In 1768, he attended a treaty in this place, of which we will give a full account. He was, we understand, the master spirit in the attack upon and burning of Hannahstown. 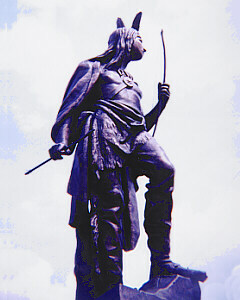 The war of 1764 has sometimes been spoken of as Pontiac, and Guyasootha's war. We recollect him well, have often seen him about our father's house, he being still within our memory, a stout active man. He died, and was buried, as we are told, on the farm now owned by James O'Hara, called "Guyasootha's Bottom." "Guyasutha was one of the most prominent of all the Indian sachems on the Allegheny. He was a man of great ability and good judgement, an implacable enemy, and a firm friend. In his youth he accompanied Washington in his trip to Venango, and is probably known in his Journal as "The Hunter." We find him on all occasions and in all places, in times of peace, and in times of war. He had been the great leader in the burning of Hannastown, and in other operations at that time." Two places dispute the honor of his burying place. Mr. Craig, as we have seen, locates the place of his sepulture in Allegheny county, but some have contended that he died and was buried at Custaloga's town, a town of the Senecas on French creek, some twelve miles above its mouth and near the mouth of Deer ceek.